A great hero needs a great villain. We love a story where good triumphs over evil and what better way to create adversity than a bad man doing bad things. One could argue that a hero or a heroine needs a baddie for without the baddie where is the hardship to be overcome? However as the good guy rides off into the sunset, what becomes of that scoundrel we so enjoyed booing? How does he live with himself? 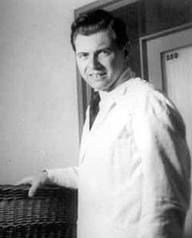 Joseph Mengele (1911-1979) was a physician and SS officer in the Nazi concentration camp Auschwitz-Birkenau. Known as the Angel of Death, his infamy came from supervising who was selected to be killed and who was to become a forced labourer but more so from performing grisly human experiments on camp inmates. Making excuses. Covering up mistakes. Explaining what’s bad or negative in a way which is not threatening. I didn’t fail; I just didn’t succeed. It’s impossible; nobody could have done it. What I did wasn’t so bad; after all, look at Osama bin Laden. At one time or another, we’ve all done it; we’ve rationalized. In psychiatry, this is called a defense mechanism whereby we attempt to cope with reality and maintain our self-image. Nobody likes to fail. Nobody likes to be wrong. Nobody likes what’s negative; we all prefer the positive. However we can be put into a position of great internal conflict if we are faced with the prospect of accepting that which spoils our self-image, how we view ourselves. It can be difficult to admit to our failings and for some, it can actually be impossible. When it’s impossible, the person in question can demonstrate behaviour which is completely divorced from reality. Who on the planet doesn’t know this story? On May 9. 2011 Arnold and Maria Shriver separate after 25 years of marriage. It comes out that 14 years earlier, Arnold fathered a son with the housekeeper , Mildred Patricia ‘Patty’ Baena. (Wikipedia) Baena’s son with Schwarzenegger, Joseph, was born on October 2, 1997; Shriver gave birth to Christopher (child #3) only a few days earlier on September 27, 1997. Married November 2009. Scandal November 2009. One hundred and twenty-one women. (Huffington Post) 5 years, 60 months. On average 2 women per month. How many jokes? That’s par for the course. He gets a hole in one and she’s teed off. I bought the Kindle version of this book in order to satisfy my curiosity. The description of it states: On Sophia van Buren’s 14th wedding anniversary, the police come knocking on her front door. The news they bring about her husband triggers a revelation that instantly causes Sophia’s suburban life to collapse. (official web site) What did her husband do and what would he have done to warrant the police? Elsewhere on her web site, in a blog posting, Ms. van Buren does offer some details and what has taken place since then. She did divorce her husband. She says she eventually forgave him. He did remarry and Ms. van Buren not only knows the new wife but is sharing custody of the children with them. What isn’t said or what I can’t find is how her ex lives with himself. How has he rationalized his behaviour? What did he tell his new wife? She must have felt he was worth marrying. How has he come to grips with his first wife divorcing him because of what he did? Joseph Mengele was not just a bad man, but an evil one. He managed nevertheless to rationalize his behaviour. Arnold and Tiger aren’t necessarily evil, but the two of them have certainly done something very bad and they are going to have to live with this for the rest of their lives. Now how are they going to manage to live with themselves? The husband of Sophie van Buren is the villain to her heroine. Obviously he has managed to make some sort of excuse for himself and moved on. A great hero needs a great villain. In the end, good triumphs over evil and the hero lives happily ever after. I wonder though what happens to the villain. In psychology and logic, rationalization (or making excuses) is a defense mechanism in which perceived controversial behaviors or feelings are explained in a rational or logical manner to avoid the true explanation. It often involves ad hoc hypothesizing. This process ranges from fully conscious (e.g. to present an external defense against ridicule from others) to mostly subconscious (e.g. to create a block against internal feelings of guilt). In Freudian psychoanalytic theory, defence mechanisms (or defense mechanisms) are unconscious psychological strategies brought into play by various entities to cope with reality and to maintain self-image. Josef Rudolf Mengele (March 16, 1911 – February 7, 1979), also known as the Angel of Death (German: Todesengel), was a German SS officer and a physician in the Nazi concentration camp Auschwitz-Birkenau. The diary, as well as 84 other documents and a hand-written life history, were found in two cardboard boxes in the records department of the Brazilian federal police in Sao Paulo. Investigators found the documents in 1985, together with books and personal mementos, in the Sao Paulo home of the German couple Lieselotte and Wolfram Bossert, as well as in their beach house at Bertioga. At the time, however, they paid little attention to their find. On my 35th birthday and 14th wedding anniversary, everything about my life changed in a matter of minutes. Eight years later, I released a book that covers a three year span of my life, beginning with that fateful night. Illumination – How One Woman Made Light of the Darkness is the story of how sometimes, what you least expect to happen does, and how, when one life collapses, a new one begins.